【Five Pairs Pet Grooming Set】 The pet grooming set includes: straight scissor, tooth shears scissor, up-curved scissor, down-curved scissor, straight comb, scissor bag, wiping cloth. Help with keeping your dogs coat tidy! 【Preminum Material】 The pet grooming scissors are made of superior stainless steel, high sharpness, durable and strong for long term use. 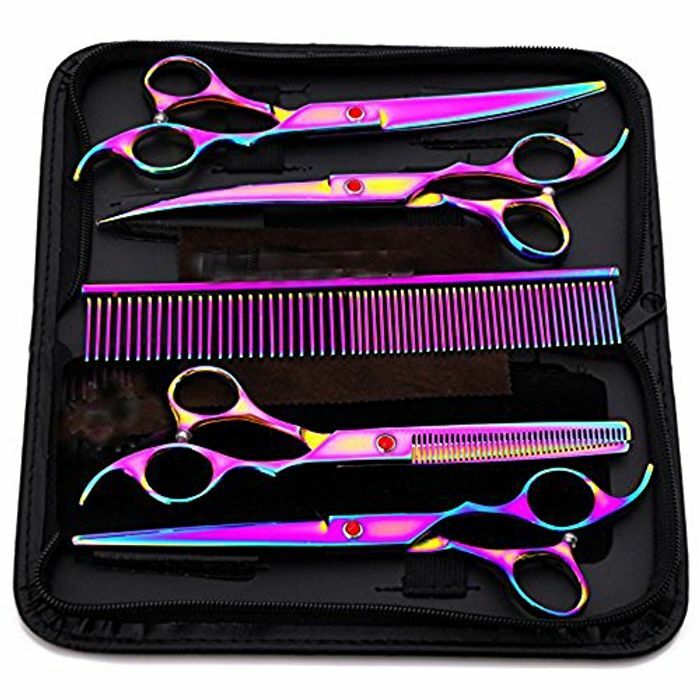 The colorful scissors are engild with beautiful and cool rainbow colorls that will never fade! 【Adjustable and Low-noise Design 】Screews on the scissors can adjust tighness of the scissors based on your needs. The rubber on the scissors not only can reduce noise to make sure the pet will not be scared, but also avoid hand grinding injury. 【Wide Use】The professional pet grooming set can be used on any hairy pet, such as Teddy, shepherd dog, Akita, cat. Any sensitive part on the pet, such as the hair on the ear, the face, the armpit...will make you have a neat & tidy golden doodle. 【Well Packaged】 The professional pet grooming set is kept in a portable bag, making them easy to carry and keep neat. Wow this is an amazing deal! Perfect for a Christmas present. Does anyone know if the shears are sharp enough? Thanks for posting!